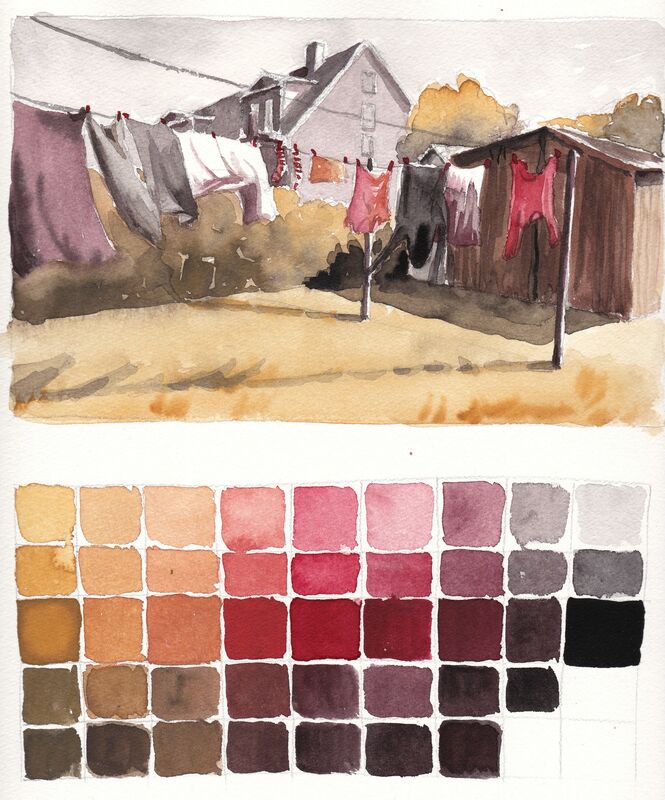 This week, I am experimenting with Anders Zorn’s reduced palette. As an oil painter this would have me using four tubes of paint: titanium white, ivory black, alizarin crimson or cadmium red and yellow ochre. As a watercolourist, I am down to just three: ivory black, alizarin crimson and yellow ochre. Exciting! I did my first test run yesterday with a bit of an everyday scene – a clothesline behind my house. I wasn’t sure at first if it would read at all as there is no green in the image whereas the original scene is green all over. But it does seem to work, albeit I had to be quite careful with the values around the hoodie and a few other spots in the painting. I made the interesting experience of having no trouble at all applying all the different shades of muted colours and reserving my very purest colours for last. Normally, I think, it’s the other way around, meaning I tend to look for places that need dulling down in the latter stages of a painting in which I use a full palette. I’ll try to stay observant as I keep using this palette so that I can share my experiences. – It seems, as I realise only now, that this reduced palette is superbly suited to painting autumn scenes!